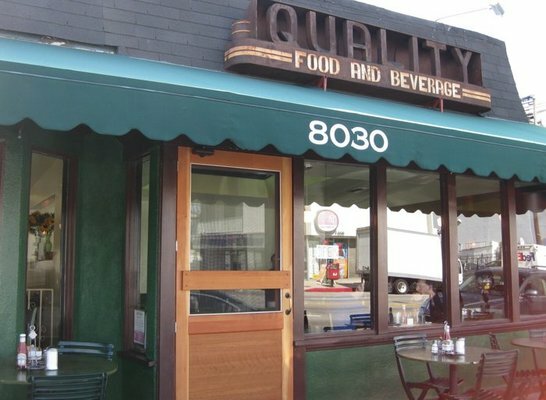 Quality is on 3rd Street in Los Angeles. Located right down the street from TOAST on 3rd, and a lot of other LA brunch “hotspots”, Quality is more low-key and a guarantee quick wait, if any. The food is comparable to places such as Toast (which I’ve blogged about), but it’s less of a scene, and a much less of a wait for a table. It’s a hole in the wall, but I enjoyed the food. If you want to skip the hassle going to a packed brunch/breakfast on the weekends with a wait in LA, Quality is a good option. Shared this with one of my girlfriends and it was delicious. I loved how it wasn’t on an english muffin, but a fresh baked biscuit. It added a buttery flavor which I loved, and a more flakey/crispy texture, and obviously adding bacon makes everything better 🙂 They’re known for their biscuits, so I recommend getting a dish there that serves one. I like to order something sweet and salty for breakfast and share with someone so I get best of both worlds. 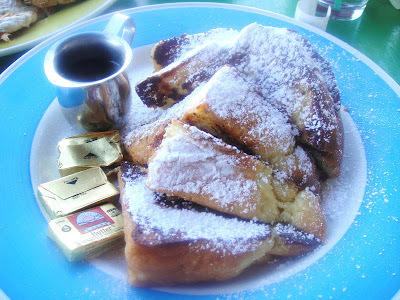 I shared this french toast with the benedict, and it was the perfect sweet and savory breakfast. Can’t go wrong with challah french toast! My health nut of a friend ordered this. Something I would never order, don’t really do THIS healthy lol, but he said it was good!